- With its tiny triskels and intricate knotwork, this Celtic raven pendant is unlike any you've seen before. If you've been looking for a sterling silver raven pendant that perfectly captures the magical nature of this incredible bird, look no further! Few animals can evoke such a powerful emotional response as the raven can, and while some may fear its guttural calls and dark plumage, others feel drawn to its potent intelligence and lively curiosity. The design for this sterling silver Celtic raven pendant was done by the gifted pagan sculptor Paul Borda, who is a master at not only capturing the physical aspects of animals, but their mystical properties as well. Even the perfect five-point star at the very heart of the raven is a symbol of its magic and enchantment. 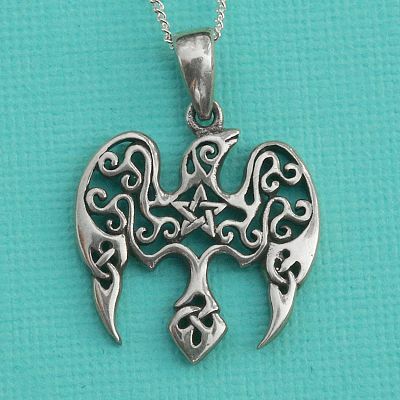 This Silver Star Raven Pendant measures 1" tall, including bail. It includes a 18" sterling silver chain. I think my spirit animal is a Raven. How can I know for sure? Those who feel a special kinship with the Raven often share its quick wit and remarkable intelligence. You are a problem-solver with a wide range of abilities in your tool bag. Nevertheless, people tend to underestimate you. That's all right, though. You'll get the last laugh, and that will make it all worthwhile. Like the harsh cries of the raven, you tend to speak the unvarnished truth, which some people find uncomfortable. Learn when to speak, and when to keep silent. Ravens and their human kin have a strong affinity to the realm of magic and enchantment. You may find that you are able to sense things beyond the range of normal human perception. Do you have any other questions about our Silver Star Raven Pendant? This pendant arrived quickly and is just beautiful. I have ordered other pendants and rings from Gryphon's moon, and have never been disappointed. I have every confidence in this site, and will be ordering more items, to be sure!